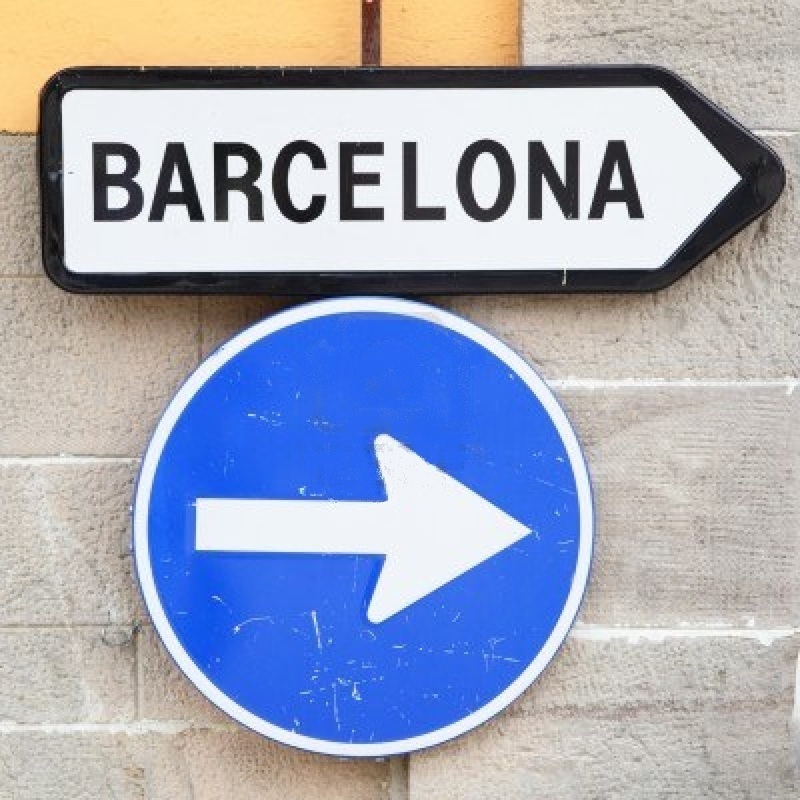 The Barcelona EGP: 6th and 7th april of 2013, the tournament takes place at Cultural Centre Convent de Sant Agusti. 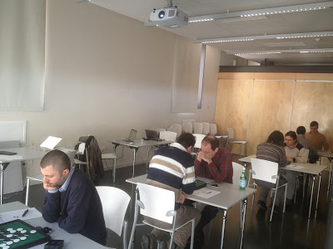 The EGP 2008 was also held here. Fee for participation is 25 €. 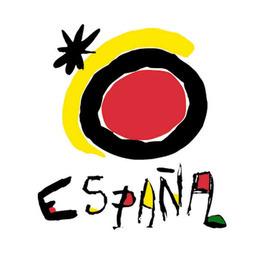 For Spanish players this includes one year membership of the Spanish Othello Association). The meeting time will be 9:00 pm on Saturday, April 6. The start time of the tournament is expected at 9:30 pm. 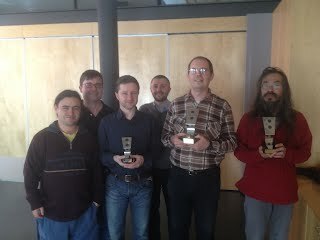 Four of the registered players won EGP points in 2012. Takuji was EGP Champion, Marc Tastet took 5th place, Francesco Marconi finished 6th and Roel Hobo was 16th. Even with a small amount of players, the battle is on!! 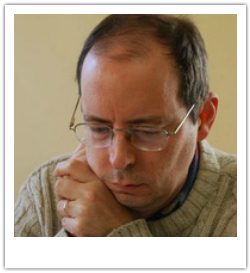 As there are only 8 players for this tournament the players agreed to play an all-round tourney today, followed by semifinals and final for the top 4 on sunday and 4 rounds all-round for the other 4 players. 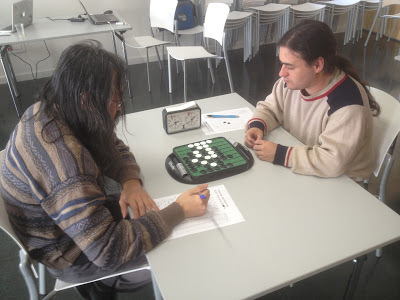 Francesco lost only half a point in a tie-game against Ricardo Budiño. In the semifinal tomorrow he will play against Marc Tastet. 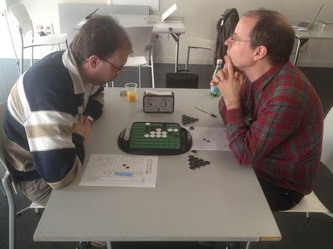 Roel Hobo and Takuji Kashiwabara play the other semifinal. 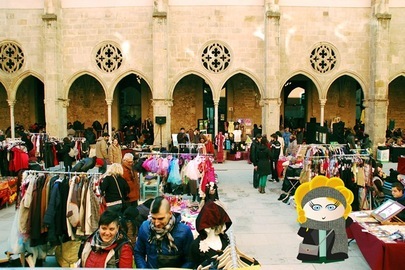 The tournament was in a very quiet old convent but on sunday morning there was a flea-market outside and loudspeakers were placed right under the tourneyroom window. Maybe this inspired Marc? The semifinals were won by Takuji Kashiwabara and Marc Tastet. Francesco Marconi and Roel Hobo proceeded to the playoff for 3rd and 4th place and that match was won by Francesco Marconi, 53 - 11. 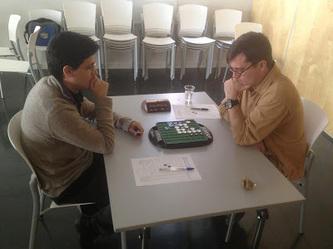 Two frenchmen in the final of the EGP Barcelona and Marc Tastet won the first game very convincingly 46 - 18. The second game was more close, but it was also a win for Marc. Marc was winner of the European Grand Prix in 1993, 1994, 1995 and 1997 will he succeed to win the EGP again 16 years later?